South Korean President Moon Jae-in returned home Sunday after a three-day state visit to Russia for talks with President Vladimir Putin over North Korea's denuclearization and economic cooperation. 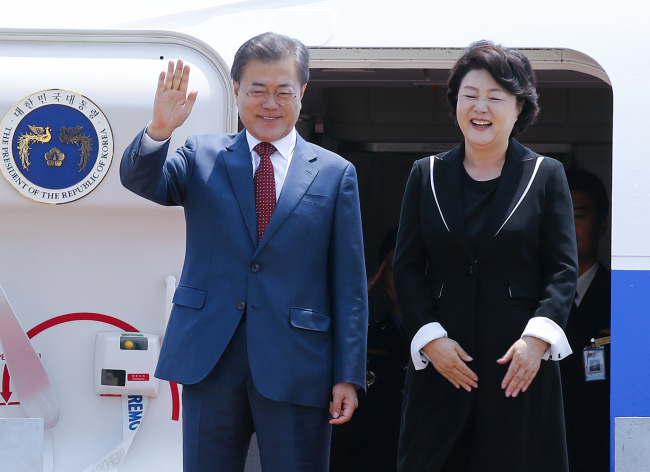 Moon and his wife Kim Jong-sook departed from Rostov-on-Don earlier in the day after they rooted for the South Korean national soccer team, which lost to Mexico 2-1 in the teams' Group F match at the FIFA World Cup in Russia. They arrived at Seoul Air Base in the afternoon. During the first state visit to Russia by a South Korean head of state since 1999, Moon sought to drum up support for his denuclearization drive and deepen bilateral economic cooperation. During his Friday summit with Putin, the two leaders agreed to work together for enduring peace on the Korean Peninsula and in Northeast Asia, while sharing the understanding for the need to denuclearize the peninsula. They also agreed to work to launch negotiations for a free trade agreement between their countries. "To achieve the goal of $30 billion in trade and 1 million in the number of visitors between the two countries by 2020, the two leaders agreed to work for practical cooperation that can actually benefit the people of the two countries," Moon's office said. The two sides also agreed to conduct a joint study to check the feasibility of cross-border energy projects involving North Korea. They, in addition, inked a series of memorandums of understanding to expand cooperation in energy, industry and investment. On Thursday, Moon delivered a rare speech at Russia's State Duma, the lower house of the Russian parliament, in which he cast bilateral cooperation as the "cornerstone of peace and prosperity" of the countries and their shared region. Moon's trip to Russia followed an inter-Korean summit in April and another in May, and the US-North Korea summit earlier this month, all of which centered on the communist regime's nuclear disarmament.